You can find instructions on many websites for making toy spectroscopes out of a cereal box, razor blades, and a diffraction grating. A regular size cereal box isn’t quite large enough to fit a camera and still leave enough room for your hands to make adjustments. However, I suggest you attempt to make the toy version before building a larger spectroscope that can accommodate your camera. 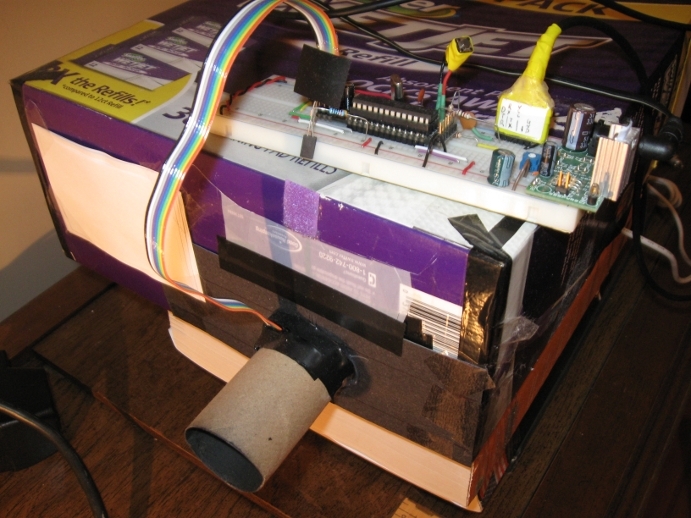 By reviewing different techniques for building a simple, hand-held spectroscope and assembling one yourself you will gain experience that will be helpful once you attempt to make a larger one. Placing the razor blades very close together while keeping them parallel can be tricky and requires a bit of practice. Most instructions you’ll find will use a CD as a reflective diffraction grating, but you’ll have a much easier time constructing a spectroscope if you buy a 1000 line/mm transmissive diffraction grating sheet since you won’t have to worry about angling the CD correctly. Here is a link to a page that describes how to build both reflective and transmissive spectroscopes. To build a spectroscope that produces images that are more easily photographed you’ll need a larger box that can completely enclose the camera and a way to mount the diffraction grating in front of the camera’s lens. The box should be about the same length as a cereal box but more spacious so that you can easily position the camera. You should cover the inside of the box with matte black spray paint or black poster board to cut down on any reflections that might occur. 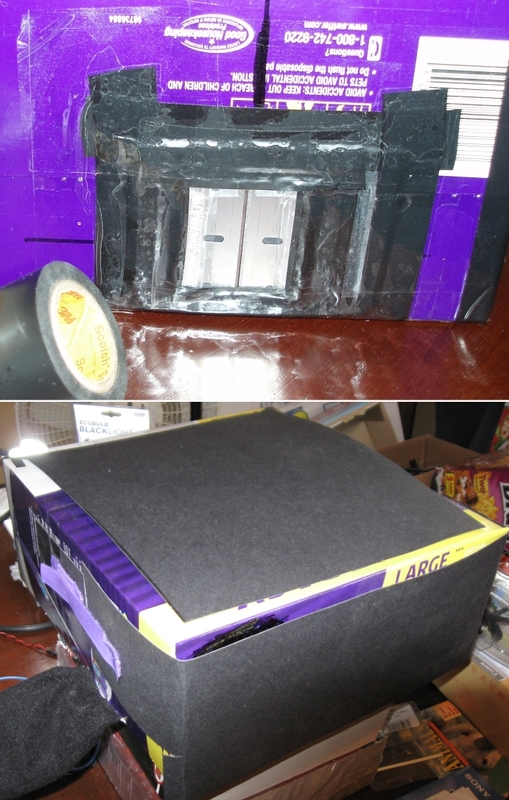 One of the flaps at the box’s entrance should be extended with black fabric or poster board to keep out stray light when the box closed. Use black electrical tape to seal up any holes, especially at the corners of the box. The entrance slit makes the light leaving the slit act like it is emanating from a single point instead of several directions. Without the slit spectral peaks would appear to be smeared across several wavelengths. It’s important to get the razor blades close together while at the same time keeping them parallel, so take your time when making the slit. A narrow slit increases the ability to resolve closely spaced lines however it also reduces the amount of light entering the spectroscope making fainter lines harder to detect. I have had good results using a slit width of about 1/32 in. (0.08 cm). I suggest you construct the slit separately by affixing the razor blades over a narrow hole in a piece of black poster board before mounting it over a second hole cut in the box. Doing it this way will allow you to test out multiple slit widths before permanently attaching the best choice to the box. The center of the slit should be the same height as the center of the camera’s lens when it is sitting in the box. 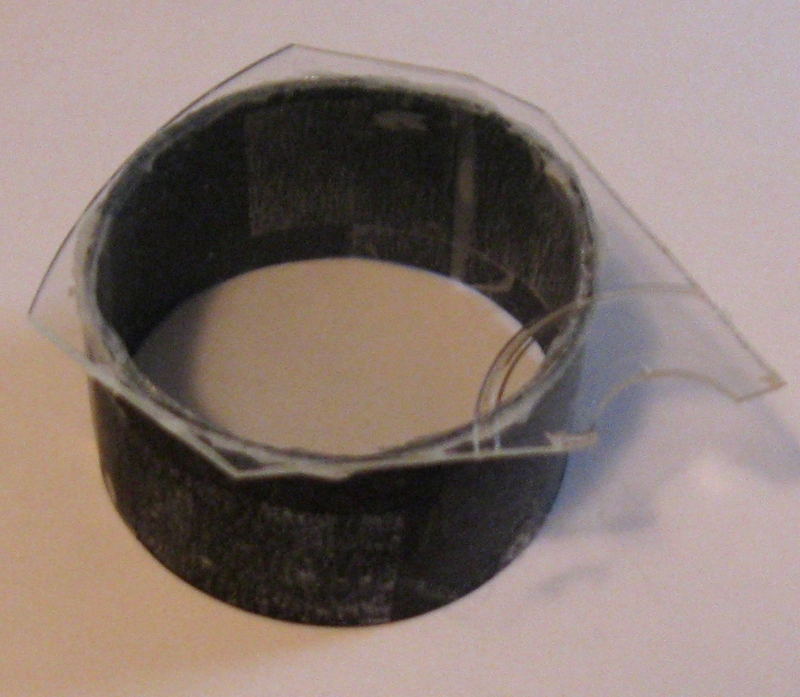 To prevent horizontal banding in the spectrographs, you can make a diffuser by stretching a milky white semi-transparent plastic grocery bag over the slit. You can make a baffle out of a toilet paper tube that has been spray painted black on the inside. This will keep out stray reflections. If you’d like to do radiometry, you should attach an irradiance sensor to one side of the slit. Follow this link for more information on working with the TSL230 family of irradiance sensors. To mount the diffraction grating in front of the camera’s lens I purchased a 52 mm glass lens meant for a flash light and glued it to the filter mount taken from a white balance lens cap. Then I taped a piece of a 1000 line/mm sheet to it. It’s best to thoroughly clean the glass lens and the diffraction grating with distilled water first. Finally, I covered the edges of the diffraction grating with black electrical tape to prevent light from passing through the lens at its borders. To use this type of assembly you’ll need to have a way to mount filters in front of your camera’s lens. 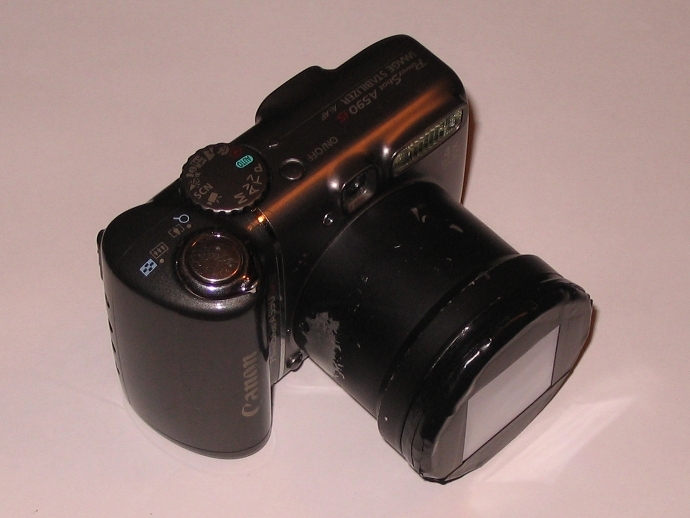 Many point and shoot cameras don’t have filter mounts; however certain Canon PowerShots have optional adapter tubes for mounting lenses. If you are unable to mount filters or lenses directly to your camera, you can still mount a diffraction grating over a hole in an opaque piece of plastic and use an improvised stand to hold it in front of the camera. I used this technique for a long time, but adjusting this type of mount can be tiresome. Most spectroscope designs I’ve seen place the diffraction grating in line with the slit and the observer/camera at an angle to the diffraction grating. However, I have found I get much better images and a faster setup time if I place the diffraction grating in line with the camera and angle both away from the slit. To bring the spectrograph into view you will need to angle the camera either towards or away from the slit until you get the spectrum centered. You will also need to rotate the diffraction grating clockwise or counterclockwise until the spectrum is level. 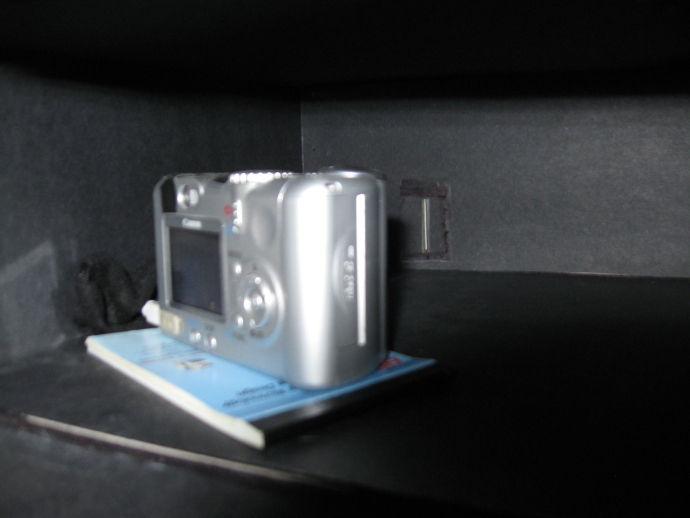 Once you’ve determined where your camera should be placed you should cut a hole in the side of the box for a USB cable. Instead of pressing the shutter release button by hand, which will cause the camera’s position to shift, it’s better to control your camera via USB with a remote capture program on your computer or a USB remote. Please note that not all cameras support remote capture or USB remotes. I used a 2″ exposure with an aperture of f/5.6. The aperture setting was simply the lowest available (most light admitted) at the zoom I used. The exposure time was chosen to give a well exposed spectrograph of the source with the lowest radiance, which was an LED. The script saturation_test will help you determine if your spectrographs are properly exposed. To prevent the calibration lamps from producing saturated images they were placed further away from the slit than the LED. A custom white balance was used because its multipliers remained constant from image to image. The other white balance settings were unacceptable because the camera fine-tunes their multipliers to better match the color content of the image. Manual focus was used when possible, but auto-focus in macro mode also produced acceptable results since the camera’s position in the box remains fixed. 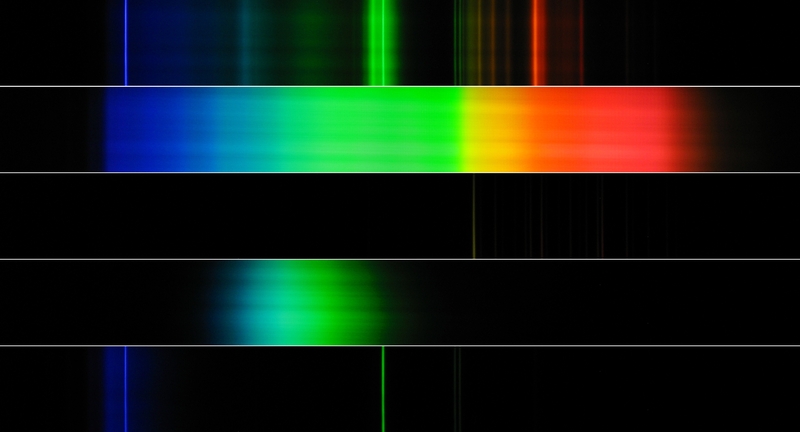 Here are spectrographs of a compact fluorescent, an incandescent bulb, a neon lamp, a cyan LED, and mercury actinic lamp. The pair of lines to the right of the bright green line in the CFL’s spectrum only differ in wavelength by 2.106 nm! Notice how the incandescent bulb is smooth and continuous and the compact fluorescent is peaky and discontinuous. Also observe that although LEDs are monochromatic light sources not all of its light is concentrated at one wavelength. In the next article in this series I’ll show how to turn your spectrographs into plots with a calibrated wavelength scale, so you can perform quantitative measurements like finding the peak wavelength of an LED. 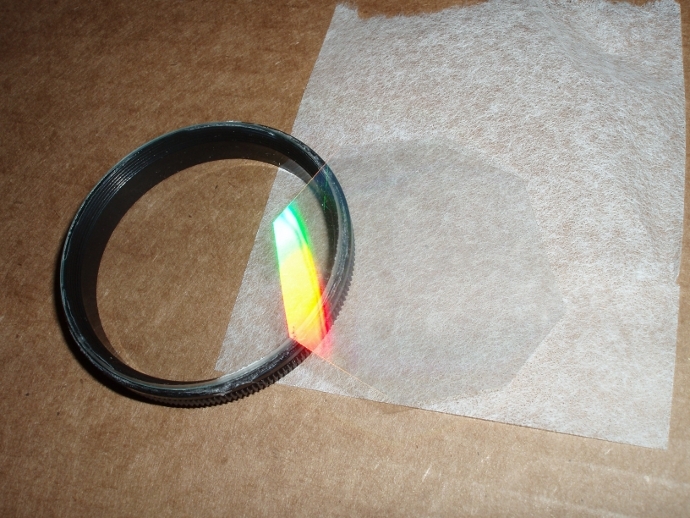 You can obtain a transmissive diffraction grating by stripping the metal backing and screen printing away from the the polycarbonate disk of a CD. This can be done with tape, but it’s a lot of trouble. If you’ve ever made a bulk purchase of CDRs stacked on a spindle, you may have noticed at the top and bottom of stack are clear disks. Sometimes these disk protectors have tracks on them and can be used as transmissive diffraction gratings. While a CD used as a diffraction grating will work, you will get the best results if you buy a 1000 line/mm diffraction grating sheet.